In this tutorial we'll refer to a practical example of Linux dd command that can be used by system administrators to migrate or clone a Windows Operating System or a Linux OS from a larger HDD partitioned in MBR or GPT layout style to a smaller SSD. In this excerpt we'll use as an example a Windows system installed on a hard disk with multiple partitions. This method can become quite complicated in case the HDD is partitioned in MBR scheme and contains an extended partition with multiple logical partitions or the partitions are out of order. I suggest you don't use this method if that's the case. In such cases it's safer to use ddrescure which can clone your entire disk layout (partition table and used blocks inside each partitions) without actually transferring the empty space. DDrescure can be obtained by installing gddrescue package from Ubuntu main repositories. You can resize a Linux or a Windows partition (shrink) to minimal size using a live Linux distribution such as Gparted or run gparted GUI utility from Ubuntu Desktop Live ISO image. 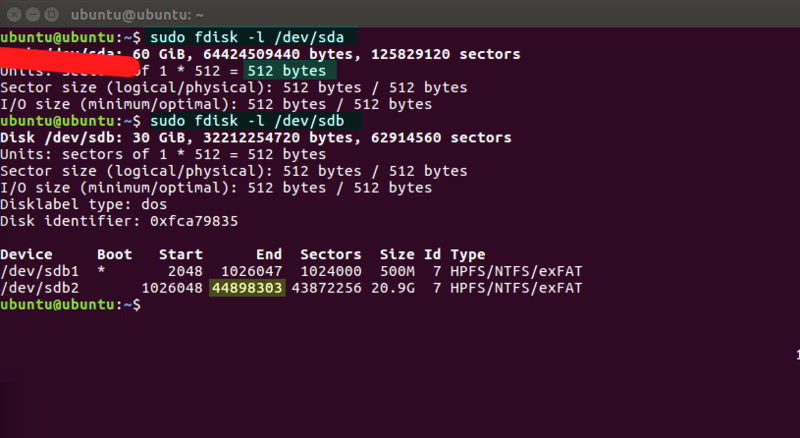 Other paid Linux distributions you can use the manipulate disk partition file system sizes (ext2, ext4, NTFS, xfs) are Partition Wizard or Parted Magic . 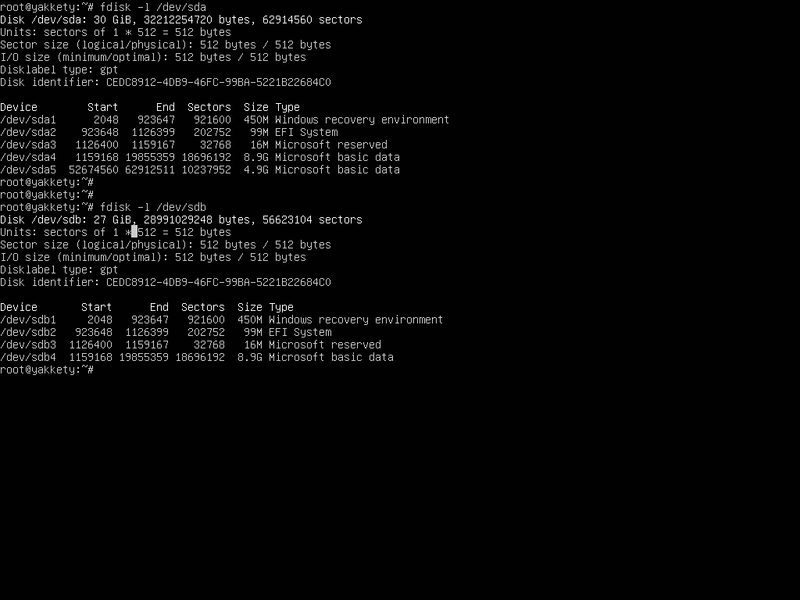 You can also use Microsoft Windows diskmgmt.msc utility in order to shrink a NTFS partition. By shrinking the free space of a partition, the required time that dd will take to copy non-used disk blocks, in case of huge partitions, will be a drastically reduced. In case of a large partition with just a small percent of used space it's advisable to shrink the file system because dd utility will also copy the unused space in the process (dd will also copy all free blocks of an 100GB or 1 TB partition which has less than 10% of used space). In this excerpt the disks are inversed, so /dev/sdb represents Windows installation the disk and /dev/sda represents the empty SSD. ATTENTION: the target disk must be at least the size of total space occupied by all partitions up to Windows partition from the source disk, including Windows partition. dd - dd stands for "Copy and Convert". Some might say it stands for 'Data Destroyer' (in case you mislead the command some serious damage can happen) or Data Duplicate or Data Description. Use whatever description suits your needs! count - Last "End" sector from fdisk output incremented by one integer (+1) - How many 512 size blocks should copy before it stops. Here, it should transfer 44099584 sectors of 512 bytes in size. In case you want to operate with a larger Block Size than the standard disk block size (512), let's say up to four times the size of standard block size (2048), for speeding up things, you can do some simple math and multiply by four the standard block size of the disk (512x4) and then divide the total number of blocks +1 of the last partition by four. In this example the "End" of sda2 : 44898303+1 divided by 4. dd will operate with a block size of 2048 bytes. After the process finishes (depending on your disk size and speed it can take ten minutes or even hours) verify target disk using the same sfdisk command and compare the outputs from both disks. The results should be similar. In this excerpt, dd will operate with a block size up to eight times the size of standard block size (4096) in order to transfer more blocks at once. The Windows OS resides in the fourth partition of the hard disk. All preceding Windows partitions must also be cloned. 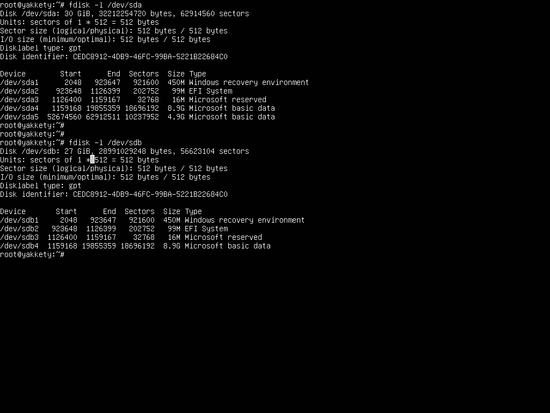 The disk will be fully copied until the last 19855359 sector, which represents the end of Windows partition boundary. 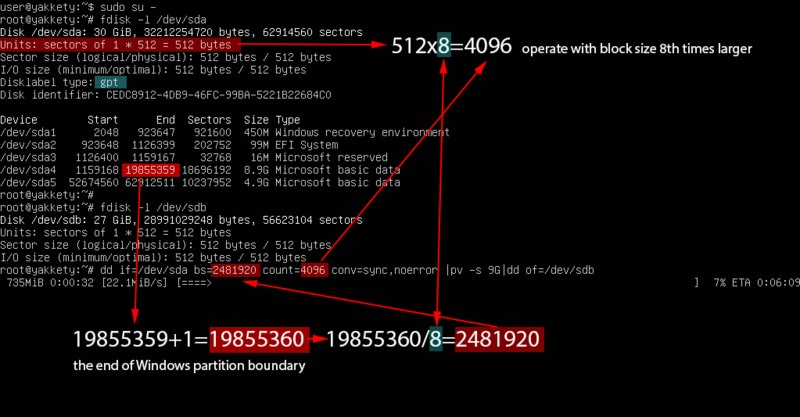 Data that follows 19855359+1 sector represents D: partition in Windows, so this partition is of no interest to us since we'll only want to clone the operating system partition. Multiply by eight the standard block size of the disk (512x8) and then divide the total number of blocks +1 of the last partition by eight as illustrated in the below image. The "End" of sda4 which represents the Windows partition is 19855359+1 divided by 8. dd operates with a block size of 4096 bytes. 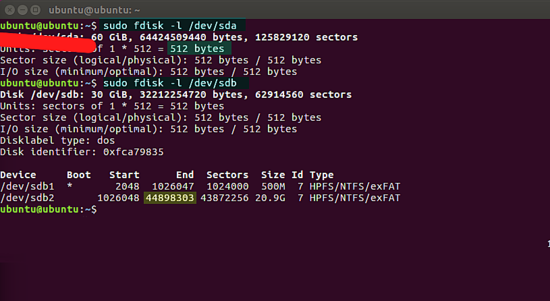 Verify the partition table differences on both disks by issuing fdisk command. The partition table should be similar, except 5th partition from /dev/sda which should be removed from the cloned disk (/dev/sdb ). Finally, shut down the machine, unplug the old hard disk and power on the computer with the new cloned disk only. It should boot-up in your operating system in no time. In case the machine refuses to boot, physically verify the SATA connectors on the motherboard and try to reverse them or go to BIOS/UEFI settings and make sure the appropriate disk is enabled in the booting-up sequence. Try not to boot-up the machine with both disks plugged-in because it might confuse the bootloader, making your machine impossible to start the operating system. After you have the confirmation that your operating system boots-up normally, use the same tool as for shrinking the file system to extend the cloned partition by adding the unallocated space. Using this dd method you can transfer any variant of Windows or Linux OS with all your custom settings, installed programs and files from a larger HDD to a smaller SSD, without the burden to install the OS from scratch and spend tons of hours to customize it. I did this yesterday on a physical disk connected to my Fedora 26 desktop via a USB toaster type box. The disk was 1TB. Installed on the disk was a sysprep'ed Windows 10 (1 partition) and Fedora 26 (3 partitions all xfs). I didn't try to shrink anything. ddrescue wrote out a 932GB .img file and it took a few hours. Then I ran the xz command on the .img file with 6 threads... and it took about 3 hours but it compressed the 932GB .img file down to 71GB. Of course a lot depends on how much software you have installed within the OSes on the disk. The extra steps you gave probably made it go faster. Your description of the bs switch is misleading. It is not block size, but buffer size and is not related to the block size of the media. Using bs=512 or bs=2k results in a very slow copy. Using bs=64M or larger dramatically speeds up the copy. bs=n Set both input and output	block size to n	bytes, superseding the ibs and obs operands. If	no conversion values other than noerror, notrunc or sync are specified, then each	input block is copied to	the output as a	single block without any aggregation of short blocks. Does anyone know how to nic boot a Linux ISO? Why Linux dd command? dd is not part of the kernel else of GNU coreutils. 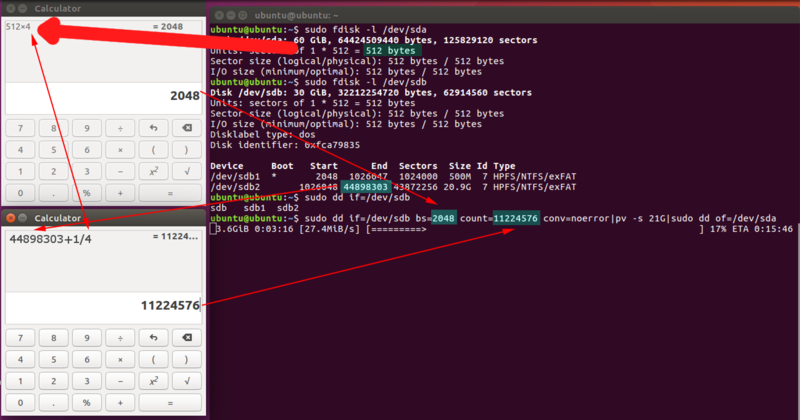 I am planning to clone internal 320 GB HDD to external 1tb HDD using dd command through Ubuntu installed on yet another external HDD of 80 GB. 1. Will partition table and boot loader copied from source HDD to external 1tb HDD? 2. What will happen to remaining around 700gb portion of 1tb HDD?